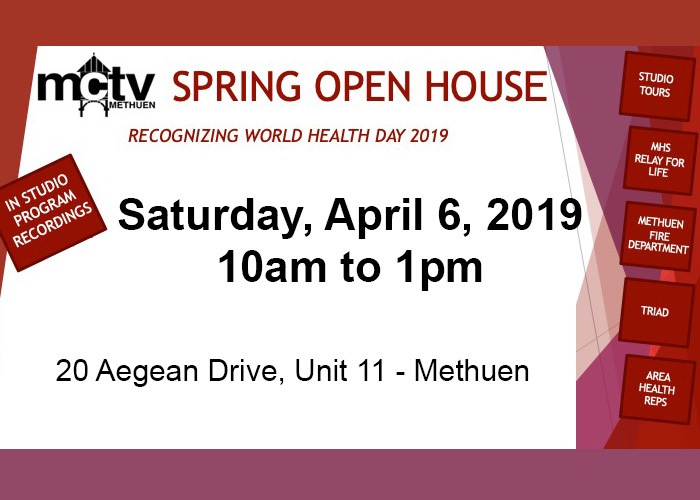 METHUEN (MCTV) – Join us for the Methuen Community Television Spring Open House on Saturday, April 6, 2019 from 10am to 1pm at 20 Aegean Drive, Unit 11 in Methuen. MCTV will be recognizing World Health Day with many health-focused and fun activities. Join our live studio audience for half hour instructional classes that will air on Methuen Community Television. The day will feature studio tours along with in studio program recordings. In attendance will be the Methuen Fire Department, TRIAD, MHS Relay for Life, and local area health representatives. In studio at 11am, THRIVE Autism Fitness with Instructor Brian Coyne. Thrive is an on-going program that is geared for kids ages 7 to 18 that are on the Autism Spectrum. This program will focus on improving fitness, motor function and behavior. This special class will also focus on the more important goals of promoting self-esteem, increase general levels of happiness, and create a safe, friendly social environment for children to THRIVE in. In studio at noon, SENIOR FITNESS with Instructor Brian Coyne. A healthy lifestyle doesn’t have to stop at age sixty-five. Led by Brian Coyne and members of the Methuen Senior Activity Center focus on improving fitness at all ages.